James and the Giant Peach a Roald Dahl classic, Everyone knows the story of James and Giant Peach. James is a young boy who lost his parents and had to go and live with his two terrible aunts, they were terrible to him and beat him and used him as a servant. One day James met a man who gave him a bag of incredible creatures, the man told him if he ate the creatures incredible things would happen. In a rush to get back into the house James dropped the bag and the creatures escaped into the ground, then amazing things began to happen. A single peach grew on the peach tree in James garden, the peach grew and grew and grew until the peach was as large as a house. One day James took off on a wonderful adventure inside the peach along with his new friends, a group of insects however, these insects are not normal insects they are larger than normal. James and the Giant Peach follows James and his friends on there whirlwind of a journey across the world from Britain to the United States and all the magical fun they get up to. This book is another of my favourite Roald Dahl books, I loved it as a child and i still love it as an adult. The Roald Dahl books are ones that i will read to my children and hope they enjoy them as much as i did when i was a child. Dahl shows a whole new light and perspective on children, he writes about them and shows them to be strong and resilient which i always loved, as a child i was a lot older for my age, i brought myself up and taught myself a lot of things. Dahl shows how children can do this and how children don't always need adults in their lives to guide them. 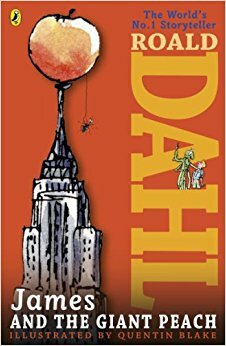 overall i give this book five stars as i always will to all of Roald Dahl's book he is a true genies with his writings.